These bees are European honey bees. Pollination. The value of pollination of plants by insects is nearly incalculable. 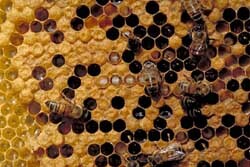 Honeybees are clearly among the most important of pollinators, and their efforts result in an estimated 80 percent of all pollination in the United States. Pollination by Honeybees in the U.S. favorably affects some $20 billion dollars in crops per year, including fruits, vegetables, and many nuts. Foods. Honey is certainly high on the list of products made by insects that may be consumed by humans. Some insects are eaten as novelties in the United States, but some other societies use beetle grubs and other insects commonly as food. Silk. The recognition of silk as a valuable product dates back to China, arguably in the year 2640 B.C. Presently, China annually produces some 30,000 tons of raw silk, which accounts for 80 percent of the world's supply. Most silk is produced from the cocoons of the Silkworm, Bombyx mori. Natural and biological control. The balance of nature depends on the activities of parasites and predators, the majority of which are species of insects. Researchers use this concept in biological control, and have been dramatically successful in many programs. Aesthetics. Insects are well known in various areas of arts and as pleasant to the senses. Butterflies are certainly one of the most appealing creatures in nature, with colors and patterns that are enjoyed by humans most of the year. Insects have been used by many societies throughout history, and have not been limited to colorful and/or large butterflies and beetles. Native Americans in the United States used parts of insects in a manner similar to feathers in their crafts. Brightly colored wing covers of certain beetles are used for earrings by Jivaro Indians of Ecuador. The Egyptians chose a scarab beetle as a symbol of their sun God. Bees were depicted on ancient Greek coins. Most branches of art have exhibited insects in some form, including a great selection of worldwide postage stamps. Lac. This is a product from Lac Scale insects, Laccifer lacca, and most of it is produced in India, from where the world receives some 40 million pounds annually. Lac is an important ingredient of many items, including floor polishes, shoe polishes, insulators, various sealants, printing inks, and varnish. Beeswax. Britain alone imports 1 million pounds of beeswax, which can be used as a base for ointments, polishes, and candle making. Forty percent of all beeswax is used in cosmetic manufacture for lotions, creams, and lipsticks. Dyes. Many species of scale insects provide dyes that are used in many products, including cosmetics and for coloring cakes, medicines and beverages. Cochineal is a bright red pigment that is gained from the bodies of a scale insect, Coccus cacti, which lives on cactus plants. Certain synthetic colors were competitors during the first decade of the twentieth century, but then were found to be carcinogenic. Thus the natural dyes from insects again flourished. Tannin is a dye that is gained from insect galls and is used in the tanning of hides and in the production of permanent durable inks. There are other galls that produce dyes. Genetics. Fruit flies have long been used in genetic studies, and are practical for such studies due to their short lifespan (about 10 days). Dermestids for cleaning skeletons. Carpet beetles are small insects that will feed on almost anything organic, including cereals, carpets, and dried insects in collections. Museum technicians take advantage of this fact, and utilize established colonies of dermestids to clean skeletons of mammals. Akre, R. D., Hansen, L. D. & Zack, R. S. 1991. "Insect jewelry." American Entomologist, Volume 37, number 2. Cherry, R. H. 1985. "Insects as sacred symbols in ancient Egypt." Bulletin of the Entomological Society of America, Volume 31, no. 2. Slosson, A. T. 1916. "Entomology in literature." Bulletin of the Brooklyn Entomological Society, Volume 11, number 3.